This study aims at understanding the role of social media in the Gezi Park movement in Turkey. The movement started as a protest of an environmentalist group then it turned into a social-political movement. The protestors were opposed to the project of re-building Gezi Park and Taksim Square that is the public area at the center of Istanbul. Politicians, demonstrators, the public and media have agreed on the fact that social media had a significant role in this movement. Social media, especially Twitter, was regarded as the main reason of this movement. 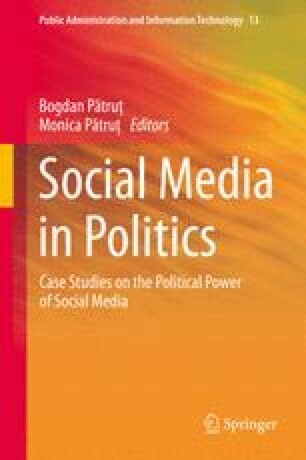 The effect of social media on politics on the development of social movements and political participation is often evaluated as an important topic in current academic studies. This study contributes to this literature by focusing on the role of social media in the Gezi Park movement. The analysis consists of Twitter functions, Twitter actors as users, and the forms of communication on Twitter. Blog.milliyet (2013). Prime Minister’s explanations about the demonstrators. http://blog.milliyet.com.tr/capulcu-modasi/Blog/?BlogNo=418570 Accessed 15 June 2013. Cihan. (2013a). Prime Minister’s explanations about the rebuilding of Taksim http://www.cihan.com.tr/news/Basbakan-Erdogan-Taksim-e-yapilacak-caminin-yerini-acikladi-CHMTA0NDU4My8x Accessed 06 June 2013. Cihan. (2013b). Prime Minister’s explanations. http://www.cihan.com.tr/news/Basbakan-Erdogan-Gezi-Parki-ndaki-eylemcilere-yarina-kadar-sure-tanidi-CHMTA2MDA1NS8xMDA1 Accessed 06 June 2013. Cihan. (2013c). The standing-man. http://www.cihan.com.tr/news/-Duran-Adam-a-374-haber-sitesi-5-gazete-yer-verdi-CHMTA2MTU5OC8x Accessed 19 June2013. Cnnturk. (2013). The number of tweets. http://www.cnnturk.com/2013/bilim.teknoloji/teknoloji/06/15/gezi.parki.tweetlerinin.linguistigi/711774.0/index.html Accessed 16 June 2013. Comscore. (2012). The Netherlands Ranks #1 Worldwide in Penetration for Twitter and Linkedin.http://www.comscore.com/Press_Events/Press_Releases/2011/4/The_Netherlands_Ranks_number_one_Worldwide_in_Penetration_for_Twitter_and_LinkedIn Accessed 13 Feb 2012.
ecktr (2013). The number of tweets in the hashtags. http://ecktr.com/ Accessed 20 June 2013.
gundem.milliyet (2013). The results of events. http://gundem.milliyet.com.tr/3-u-agir-toplam-3-bin-500-yarali/gundem/detay/1718297/default.htm Accessed 04 June 2013. Hürriyet. (2013a). About the people were arrested by police in İzmir. http://www.hurriyet.com.tr/gundem/23438875.asp. Accessed 06 June 2013. Hürriyet. (2013b). The explanations of the Prime Minister. http://www.hurriyet.com.tr/gundem/23429709.asp. Accessed 06 June 2013. Insanhaber. (2013). The results of events. http://www.insanhaber.com/guncel/21-gunun-bilancosu-4-olu-7822-yarali-h16629.html. Accessed 18 June 2013. Memurlar.net (2013). The results of events. http://www.memurlar.net/haber/378927/. Accessed 04 June 2013.
twitturk (2013). The standing man. http://twitturk.com/tweet/search?q=duranadam Accessed 23 June 2013. Yurtgazetesi. (2013). About the broadcasting animal documentary on the prestigious news channel “CNNTurk” http://www.yurtgazetesi.com.tr/gundem/cnnturke-sevgiler-h36551.html Accessed 15 June 2013.